perhaps recognizable to you, old patterns intrigue me. with much pleasure i have tried some because they are good material to practice my skills. next to that they are available for free and again, it’s fun to make them. but today i saw something on freevintage.com that i could not estimate whether it was beautiful or not. daisy chair set pattern – free vintage crochet pattern from star variety show, book no. 21.
next to me on my desk was a hook and some leftover yarn and …. voila, what do you think? beautiful, isn’t it?! i think it is a nice motif to try with thicker yarn too. you might also like to test patterns and have leftover yarn or yarn that you have used for other projects and which can be reused. tip for a rainy day! here are the links to my pinterest boards for vintage patterns, i hope you find something to your liking. Categories: crochet, inspiration | Tags: old patterns, patterns, vintage | Permalink. we have had a number of festive days and it’s finally spring in the netherlands, the sun shines! friday i made a cover for a vase i received as a gift a few years ago. the limescale i did not get properly removed, not even with brutal methods. i have combined two types of mercerized cotton from my stash: phildar coton 3 (colors: ciel and perle) and scheepjes isis (color: no name). for the bottom i used the first 8 rows of an old pattern and from row 9 i customized the cover. honestly i’m not very happy with the result, i love smooth and sleek covers more like the ones for my other vases. i do love the doily bottom, it is from: 3 piece “shells” set – crochet charm with famous dmc cottons – dmc corp. 1950 and you can find the pattern in the web archive. 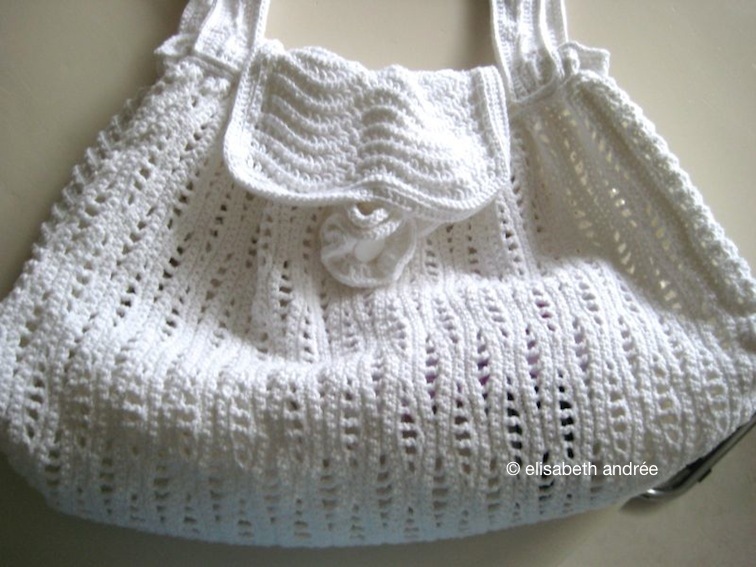 Categories: crochet | Tags: doily, old patterns, vase cover, yarn | Permalink. for the new week to start, no story today about how things are going with the blue diamonds blanket but something different. a few times i was asked whether i have favorite patterns but i always found – and still find – this question difficult to answer. but i thought i just make a short list of patterns i worked with and i love to publish on my blog and here they are in random order. i think this is such a great pattern for a square, it is made by so many crocheters in a variety of colors and color combinations. it seems that with this pattern you can’t go wrong whether you are making a blanket, a bag, a pillow or coasters. i will surely make this square again in the future. for this pattern holds: go nuts because it will always be beautiful – at least i think so – whether you make it all white or combine a variety of colors. i have used old patterns that i found in the webarchive, especially the doilies are a source of pleasure. the center of an old doily is often a beautiful flower or a flowery motif and it gives a surprising effect when you use acrylic or wool instead of very thin yarn/thread. a small flower has suddenly a whopper size. 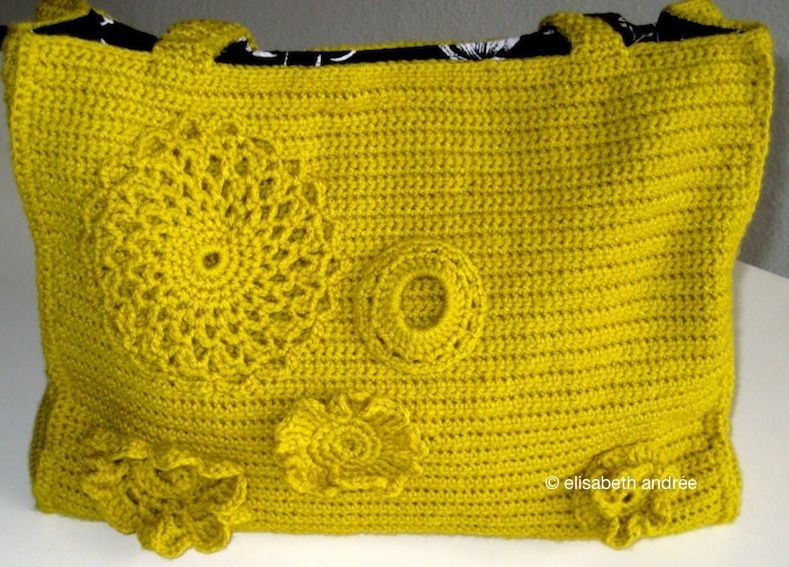 if you do not have (much) experience with this type of crochet then these links might be useful. you will find them at the bottom of the blog post. of course i also like ripples. below a few links for some patterns that i love. 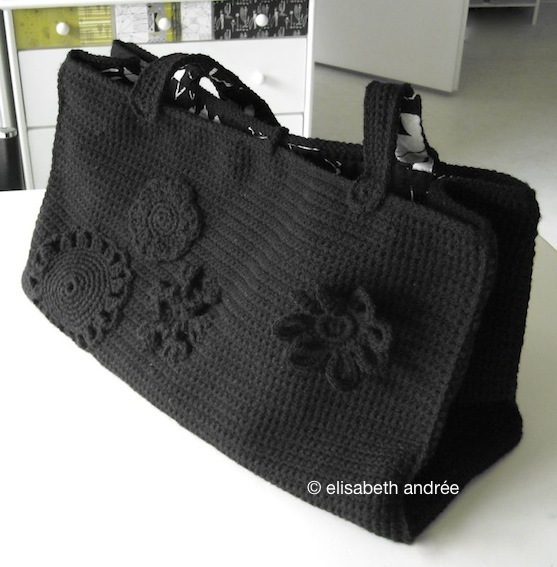 years ago, i have combined two ripple stitch patterns of mypicot and made this bag. the quality of the picture is bad, sorry about that. 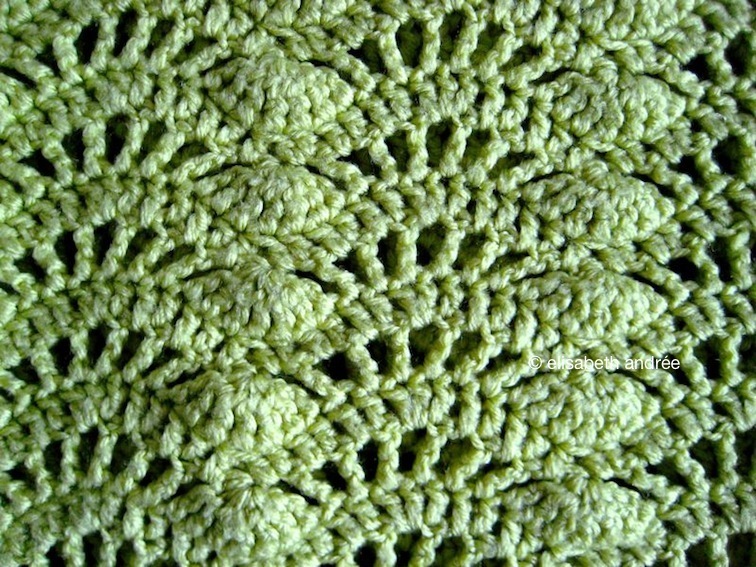 also a few years ago i made some blankets including this spring green example of acrylic yarn. alas i can not remember which stitch pattern i’ve used only that it was for a pullover or vest. an internet search brought me to this pattern for the antigua throw of caron and don’t you think the blankets seem a bit alike? recently i made the spider blanket and before a spider bag with the same pattern. 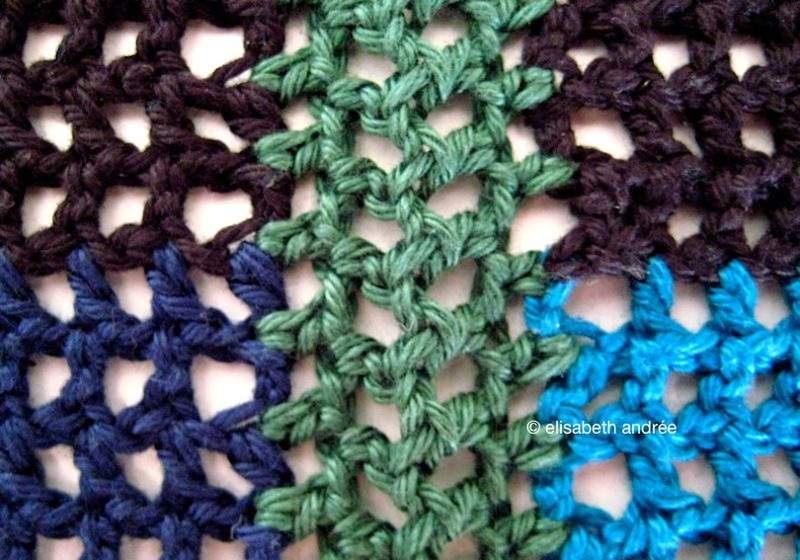 i love the gorgeous stitch patterns in diagram on mypicot.com, they are almost all equally beautiful. i am a fan and also a member of the mypicot club although i visit the site far too little. the reason i so appreciate these patterns is because they are versatile. you can with you own creativity and the yarn of your choice do anything with it. versatility is something that i love. my choices are maybe not a huge surprise and the patterns are probably familiar to you but i hope you love them too! Categories: crochet, tutorial | Tags: crochet, crochet stitches, inspiration, old patterns, patterns, spider stitch pattern, stitch pattern, tutorial | Permalink. 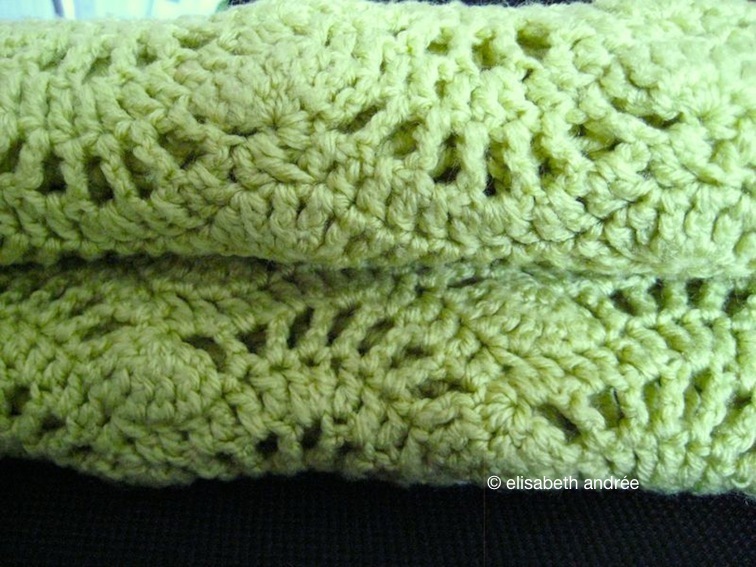 not long ago i showed you these motives that i’ve crocheted a few years ago. some of them i made using very old patterns and i’ve learned a lot of that. the generations before us and the generations before them crocheted impressive works. the women learned to crochet and developed their skills and designed themselves, without books, magazines, let alone the internet. there are many patterns preserved. so if you like me, can’t or won’t buy expensive books for your own good reasons, don’t worry just look on these sites, but it takes time and there are no pretty full color pictures. a while ago i came on angelfire.com/folk/celtwich many times because old patterns were gathered there. but for all sorts of reasons the lady had to quit. fortunately, these patterns are still accessible to us. decorating bags, back pockets, knees and elbows on clothes. i made a few doilies of thick acrylic yarn for someone who, with textile hardener, made bowls of them. to give you an idea, below is an example of a motif (with a counting error) that is actually part of a lace tablecloth. with acrylic yarn and crochet needle 4 mm, it looks very different. if you would follow the complete instructions you could make an interesting bedspread. or a couple of extra rows on the motif and voila you have a cushion cover. the name is sunburst splendour no.7533 (1942). anyway, i hope you have lots of fun with these old patterns. Categories: crochet, inspiration | Tags: crochet, old patterns, pattern, vintage | Permalink. 2006 – 2008 were stressful years and the more stress the more i was crocheting. i could not really find patterns in dutch so i learned to understand patterns in english. mostly i used old patterns for doilies because i think they often have beautiful centers. later i found diagrams that i could not understand and there was not much information available as it is now, although it is only a few years ago. i gradually got the hang of it, and now i prefer diagrams above written patterns. i have done all practicing with a yellow shade (curry, mustard) acrylic yarn and the motifs are in a cardboard box in a closet. on the photos you see about the half of them. recently i woke up in the middle of the night with the idea of ​​making some sort of card for new year’s day. the next day i formed words with the yellow motifs on the ground but it did not fit in the picture (only new did), so i made parts of words. i wobbly stood on a ladder with my camera and the light went from sunny to cloudy. the second photo shows you a part of the first result and i am sure you can imagine i was not happy about it. then i e-mailed jeroen who is a photo expert to my opinion: “please help? !” he mailed back immediately: “mail me your pictures”. a few days later i emailed jeroen again: did you forget about my pictures? … whine, whine, whine… as if the man has no other activities. the next day i received an email from him with these results. quite amazing! Categories: blogging, inspiration | Tags: happy new year, inspiration, old patterns | Permalink.